This is an awesome vertebrate fossil. 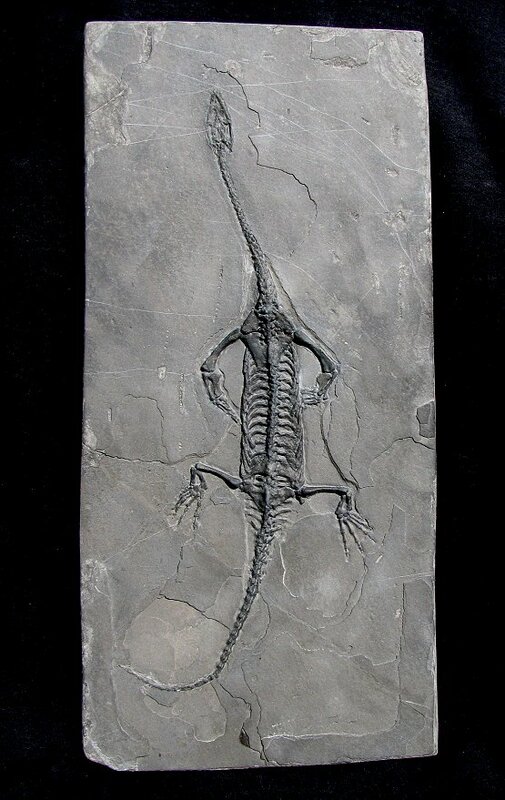 It is a fabulous Keichousaurus hui from the Triassic of China. This specimen was meticulously prepared under a microscope in the EXTINCTIONS Prep Lab. This large dinosaur-like reptile is very well-preserved and exhibits extremely fine detail - the bone structure is just incredible! The head, long neck, body, limbs, and lengthy tail are all easily seen. The legs are nicely displayed, almost all of the tiny digits of the feet and hands are present! The long teeth are even seen sticking out of the mouth - very cool! The distinct Keichousaur has great color and contrast and is beautifully showcased on the rectangular plate of shale. And at almost 11 inches (almost a FOOT LONG! ), this is a large example of this type. 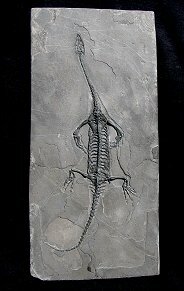 This is a top quality, professionally-prepared example of this dinosaur-like reptile from the Triassic - a very collectible display fossil.